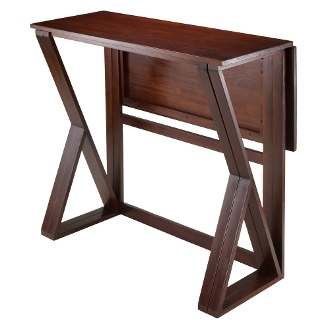 Harrington Drop Leaf High Table is a perfect table for your gathering and dinner. Table features a drop leaf extension with a surface area of 39.37"W x 15.75"D. Table dimension when the drop leaf is down is 39.37"W x 16.59"D x 36.22"H. Fully extended table size is 39.37"W x 31.50"D x 36.22"H. Constructed from solid wood in warm Walnut Finish. Assembly Required. Fully extended table size 39.37"W x 31.50"D x 36.22"H. Table closed 39.37"W x 16.59"D x 36.22"H.
Each Drop Leaf has surface area of 39.37"W x 15.75"D. Gate legs to support extended top. Constructed from solid wood in warm Walnut Finish. Assembly Required.